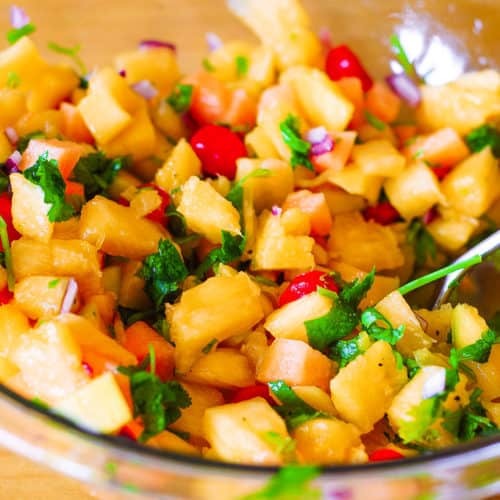 Pineapple mango salsa made with cherry tomatoes, red bell pepper, red onion, cilantro, with freshly squeezed lime juice, and a pinch of red chili powder and red cayenne pepper. Healthy, vegetarian, gluten-free, and vegan recipe full of fresh tropical fruit and veggies. 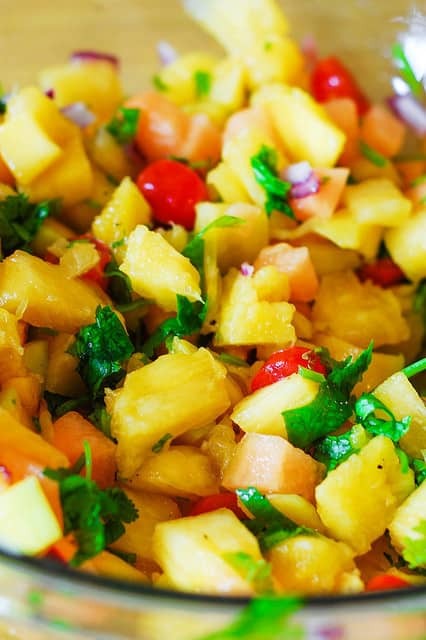 I am very excited to see the first fresh mangoes of the season – so, naturally, I made some fresh pineapple mango salsa – one of my favorite ways to eat mangoes! While it’s great as-is, as a light snack, it’s also great when served atop a fish, grilled chicken, or pork. Great Summer recipe! The flavors of tropical fruit and veggies mingle really well in this recipe. You combine both tropical fruit (mango and pineapples) and vegetables (cherry tomatoes and bell peppers) together in this dish. Sweet and savory tastes so good together! Lime juice, salt and pepper provide just enough seasoning to the salsa to bring out all the right flavors. Add just a touch of spice. Sometimes it’s nice to have some extra spice or extra heat, and I occasionally like to add a touch of red chili powder, cayenne pepper and/or cajun seasoning to my salsa to spice it up. I list those spices as OPTIONAL under my recipe instructions, as the recipe is just as good without them, too. This recipe is so versatile! It works as an appetizer, side dish or a salad. 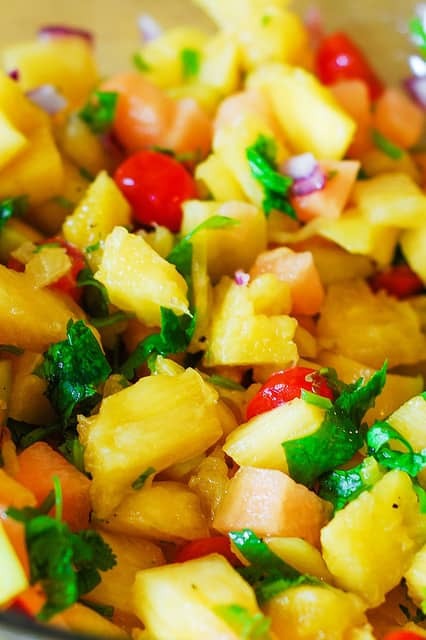 This pineapple mango salsa is healthy, vegetarian, gluten-free, and vegan recipe. 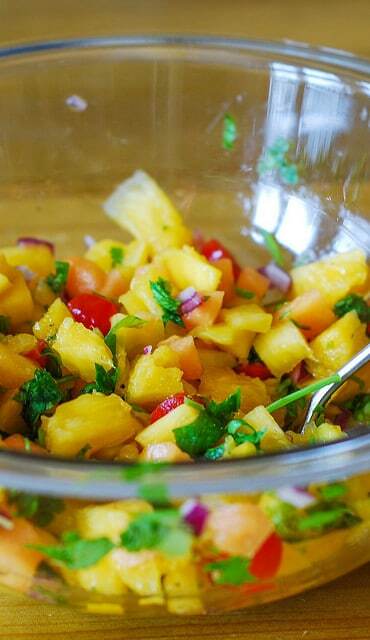 This pineapple mango salsa is a perfect recipe to make in the Summer – so light and fresh! Pan-Seared Black Cod with Tropical Fruit Salsa – healthy, delicious, Mediterranean-style recipe. In this recipe you can use any white fish: black cod, tilapia, mahi mahi, halibut, sea bass. Broiled Salmon with Mango Salsa – Packed with high quality proteins and omega-3 oils! This is a truly well-rounded dish: very colorful, full of anti-oxidants, fiber, fruit (mangoes and pineapple), vegetables (tomatoes and onions), protein and healthy fats ! Shrimp with Mango Salsa and Rice – super refreshing, delicious, gluten free Mediterranean recipe to make at home. Pineapple mango salsa made with cherry tomatoes, red bell pepper, red onion, cilantro, with freshly squeezed lime juice, and a pinch of red chili powder and red cayenne pepper. Use this recipe as a salad, side dish, or an appetizer! Mix all chopped ingredients for in a large bowl, add lime juice, add salt and pepper to taste and optional spices (if desired) - and mix well. Set aside to allow the juices combine together. How long does this salsa last in the fridge? Love this! Also works well with cucumbers instead of pineapple. Have used radishes instead of peppers. It all works beautifully. I made enough for a week of lunches and it was great to the last spoonful! Wow, what a great idea to use cucumbers! I’ve got to try that! And yes, it does make a delicious lunch!